Morocco, Algeria, and most grasslands south of the Sahara desert. Densely vegetated grasslands – prefers to be close to water. Wild: Carnivore – eats small mammals, birds, frogs and fish. 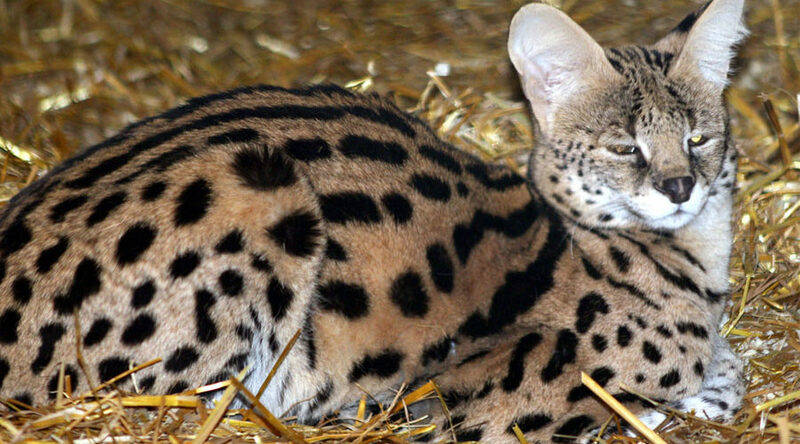 Servals are slender, tall cats with long legs and a fairly short tail. Their large, oval ears are set close together. The neck is long and the head small and slim. The coat is tawny-gold in color and marked with round black spots. Generally the spots are large and tend to merge into body-length stripes on the neck and back. Occasionally, there are numerous small spots, giving a speckled appearance. Unlike most cats, the Serval’s large dish-like ears allow it to depend almost exclusively on its hearing to hunt. It walks slowly through the grass scanning for sounds. When ‘zeroing in’ on a sound, it will stop and stand with its eyes closed and concentrate on the sounds. This cat specializes in hunting mole rats. The large ears allow it to hear its prey moving underground. Once a tunnel is located, the Serval will dig into it and wait with an upraised paw. When a mole rat appears to repair the damage, it is stunned with a powerful slap of a paw. The Serval then pounces on the stunned animal killing it quickly and easily. This hunting technique makes it one of the most successful feline hunters. 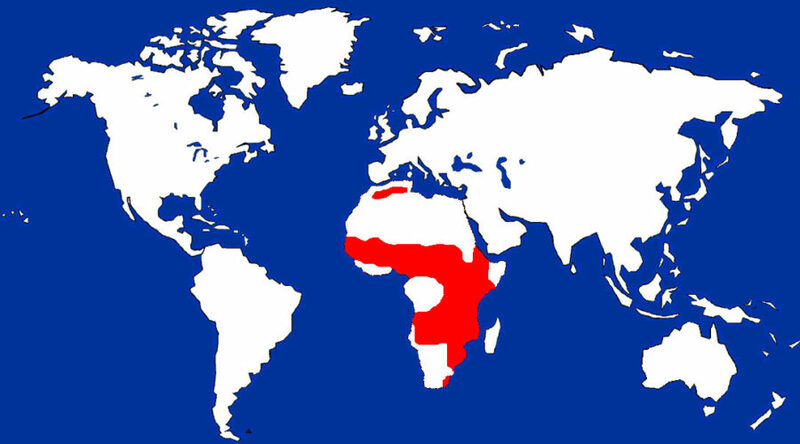 Genetically speaking, Servals share a common ancestor with Lions, although the Serval evolutionary lineage is separate from their larger kin. DNA analysis has shown that Caracals and African Golden Cats are related to Servals, as are Cheetahs. Some geneticists believe that Cheetahs may be descendants of the Serval line. Mating and Reproduction: Little is known about the mating and courtship in Servals. When a female goes into heat, she will keep company with a male for a short period of time, resting and hunting with her partner. She prefers to give birth in a quiet, sheltered location, with abandoned Aardvark burrows being a favored choice for dens. Kittens are born with eyes closed – they open in about a week and kittens are following their mother out into the open in about 3 weeks. By one year of age, they are on their own. Amazing Information: Servals are capable of some truly spectacular leaps. They are able to jump 20 horizontally from a resting position and often as high as 9 feet into the air. Their long legs also help them reach speeds of 50 mph.